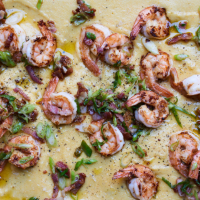 "This is my take on the classic Shrimp and Grits that hail from the southern states of America. Deeply satisfying and savoury, while quick to whip up, this prawn dish is the perfect accompaniment to my luxurious polenta recipe opposite. The main difference between grits and polenta is that Americans traditionally use white cornmeal as opposed to the sunnier yellow Italian cornmeal. 1. Place the prawns in a bowl with enough olive oil to coat them, add the crushed garlic and allow to marinate while you get everything else ready. This dish cooks fast so have everything prepped and organised before you start cooking. 2. Heat a frying pan over a medium heat with a slick of oil. Add the bacon and fry until it is starting to crisp and the fat has rendered. Remove the bacon from the pan with a slotted spoon and set aside. In the same pan, melt the butter in the remaining bacon fat. Turn up the heat to high and add the prawns. You want to cook these hard and fast. When they have begun to turn opaque, return the bacon to the pan along with the spring onions, salt, pepper and cayenne. Check for seasoning and give it a generous squeeze of lemon juice before serving alongside the polenta.